Chinese director Zhang Yimou's recent historical drama "Shadow" has encountered fresh trouble, with a music college teacher and her team filing a lawsuit on Nov. 16 accusing the film's production studio of music theft. Dong Yingda, a composer and teacher of the Central Conservatory of Music, participated in the composition and performance of the film's music score with her team, most of whom are her students. In a long post on her Weibo microblog account, she said Zhang Yimou had commissioned her in February 2017 to create the score. On this basis, she assembled a team consisting of the nation's top musicians, performers and ancient Chinese music experts as well as her best music students to create the music for "Shadow". They finished their work at the end of October 2018 and signed contract with the producers. However, Dong Yingda said she was told they could not be credited in the final cut of the film as the studio had hired another musician, Wu Liqun, to create the score. However, Dong said part of their music was used in promotional materials, and even as an alternative version in the final cut of the film. The composer and her team became very angry after watching the film, which debuted in China on Sept. 30. "We are stunned that the whole film's music, from melody, harmony to style and use of instruments, is extremely similar, and even exactly the same as our version. They just changed performers to play based on our music, so, how can they claim they are original? This is a big joke!" Dong angrily pointed out. After several communications with the film's major producer Le Chuang Entertainment, Dong failed to produce any result as she and her team were still not listed in the film credits. The composer filed a lawsuit against the studio, seeking the deserved credit, damages and compensation. "Our collective voice is due to the fact the film industry doesn't care too much about the originality of music and has no sense of intellectual property protection. We hope our lawsuit and efforts can help more Chinese musicians to gain more interests and protection," Dong said. Le Chuang Entertainment released a statement on Sunday stating it had parted ways with Dong and her team due to creative differences. However, the company said it had credited Dong's team as "early phase composers" in the film, which Dong said had not noticed. Dong is also credited in promotional materials and a documentary about the film. Le Chuang said it understood and respected the demands of Dong regarding intellectual property rights, and would actively deal with the lawsuit and cooperate in any investigation launched by appropriate parties. 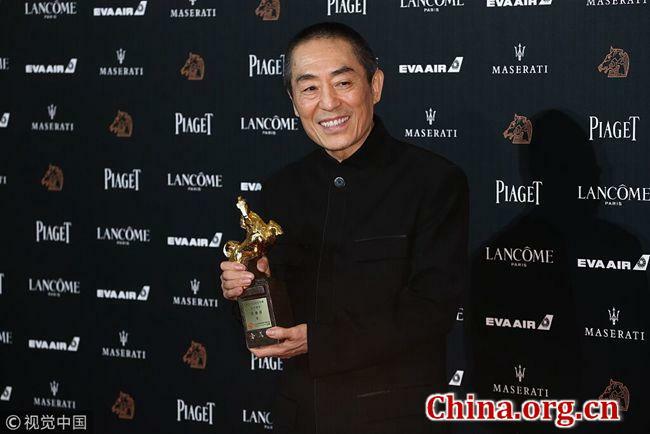 "Shadow" won the best director award for Zhang Yimou, along with three other awards out of 12 nominations at the Taipei Golden Horse Awards of China's Taiwan province on Nov. 17. Zhang Yimou's "Shadow" met troubles with a music teacher and her team filing a lawsuit accusing the film's production studio of music theft.